An afternoon in autumn sunshine, plus the occasional cow, rising to the challenge. © EHN & DIJ Oakley. We have the benefit of powerful technology which facilitates almost everything we might want to do. So why not just use it? Yesterday afternoon we spent a few hours, sat in glorious autumn sunshine, on top of the downs just half an hour’s walk from our house. I had carried up my portable radio gear, and devoted my attention to talking to other amateur radio operators literally around the world. 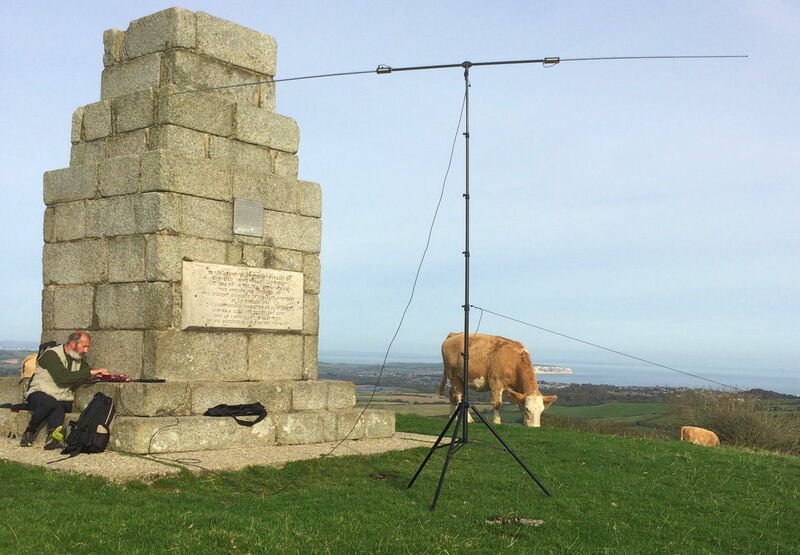 * But this article is not about ham radio: it is about why anyone should want to do something like that. Being a fine day, and during one of the regular Walking Festivals held here on the Isle of Wight, quite a few people came up and passed the time of day. Although the obvious question – why didn’t I just use Skype to talk to Brazil or the US – did crop up, most could grasp that there was something different, almost magical, about using a little low-powered portable radio and a tiny antenna, to work such distances. I hadn’t carried my gear all that way just to talk to someone overseas. Similarly when I sit painting a landscape around here, if I wanted to make things easy, I could have just flourished my iPhone and taken a quick photo. Neither did I carry all my gear and work for many hours just to get an image of that landscape. When you get home late, tired at the end of the day, it is natural to opt for a convenience meal or takeaway. But when you have got the time, isn’t it lovely to craft a meal from basic produce, lovingly preparing each of the ingredients until they are just right, and bringing their flavours and colours together just as you want? There are even times when – given a few moments – it is with great pride that you might write your own little AppleScript app to accomplish a task which regular apps make inordinately clumsy. These are examples of how we can take pleasure in applying our skills and effort, where maybe there is a simpler way if we just bludgeon it with technology. I think it is important to make time and opportunity to exercise our skills, crafting our way past the facile. Posted in General, Life, Macs, Painting, Technology and tagged amateur radio, AppleScript, cooking, craft, ham radio, painting, QRP, SDR, style. Bookmark the permalink.